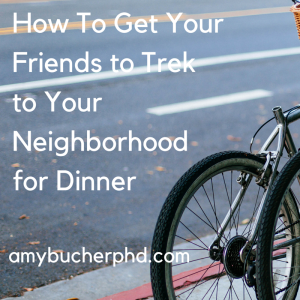 How To Get Your Friends to Trek to Your Neighborhood for Dinner | Amy Bucher, Ph.D.
Issue the invitation well in advance. We discount the effort our future selves will have to make, and are more likely to agree to something difficult if it feels far in the future. Securing agreement to dinner 3-4 weeks in the future also has the added bonus that people are less likely to have made plans yet for that date. Invoke reciprocity. Have you frequently made the effort to meet your friends at locations convenient to them? Subtly remind them in the context of your invitation. For example: “When we had dinner in your neighborhood, I was thinking it would be fun to eat in my neighborhood next.” Another tip: Bring up your invitation while hanging out in the other person’s neighborhood. Add a dash of social proof. Invite a group, and as soon as you secure agreement from one person, be sure to make that known. “Hope you can join me AND OUR OTHER FRIEND for dinner!” Social proof has the added benefit of invoking FOMO. Choose well. If you want people to repeat the behavior–that is, to come back to your neighborhood for future dinners–the first experience should be positive. Creating positive memories around an experience for people lowers their barriers to committing to that behavior again in the future. All of this is to say, I enjoyed a dinner in Jamaica Plain last weekend even though it’s a thousand metaphorical miles away from my neighborhood! Kudos to my friend who wisely used all of the above psychological tactics to make it happen. Marketing by Social Proof: Tequila! The Secret Ingredient to a Lasting Marriage? Kindness.